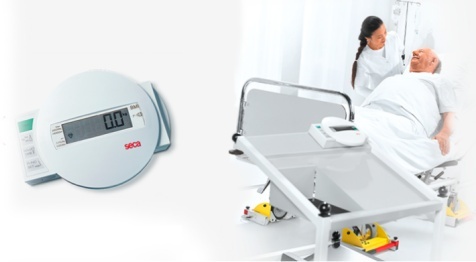 Always in use: the seca 984 digital bed scale facilitates the easy, gentle and precise weighing of bedridden patients and is an indispensable aid in dialysis and intensive care. With the integrated lifts, four load cells can be placed easily and effortlessly under the castors of the bed. Capacity: 1100 lb. The Seca 984 Digital Bed and Dialysis Scale with Equipment Trolley facilitates the easy, gentle and precise weighing of bedridden patients and is an indispensable aid in dialysis and intensive care. With the integrated lifts, four load cells can be placed easily and effortlessly under the castors of the bed. 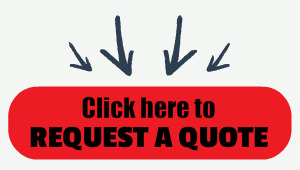 The previously determined weight of the bed is deducted using the TARE function and the patients precise weight is determined. In the event of a power failure, the scale stores all previously displayed values using rechargeable batteries. 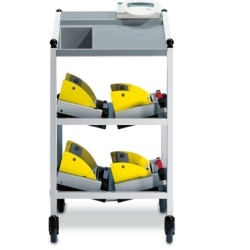 When not in use, the four bed lifts can be stored on the equipment trolley.